We’re proud of our rich history working with volleyball organizations across the country, and today’s announcement shows how trusted AES is in the volleyball world. 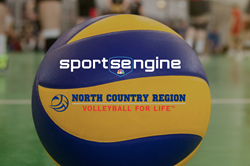 SportsEngine, Inc., a division of NBC Sports Group, today announced that it has become the Official Technology Partner of North Country Region Volleyball and will power registration, scheduling, and competition results with their AES (Advanced Event Systems) volleyball software, along with providing sport management software to their member clubs. SportsEngine provides financial management tools for online registration and invoicing, along with communication tools and flexible content management software to power volleyball clubs and teams across the country. AES, by SportsEngine, provides a wealth of proprietary solutions as part of a their platform for more effective and streamlined event management. Its advanced infrastructure and software modules create seamless online registration, hotel management, scheduling services, and results tracking. North Country Region currently boasts programs for multiple levels of play, including junior girls, junior boys and adults. Through lectures, seminars and clinics, coaches are trained to help teach athletes to improve their game of volleyball. Each year, North Country Region athletes have the opportunity to participate in regional and national amateur volleyball competition. Visit http://www.ncrusav.org for more information on upcoming North Country Region tournaments being held in your area. Helping the world play smarter and live more, SportsEngine, Inc., an NBC Sports Group company, is the leading provider of Sport Life Management mobile applications for coaches, parents, and athletes and Sports Relationship Management tools for governing bodies, leagues, clubs, associations and events. SportsEngine, Inc. powers over 650,000 teams, leagues, and clubs, helping them manage, connect, and communicate with a diverse range of stakeholders, including athletes, parents, administrators, coaches, referees, scouts, volunteers, fans, journalists, and sponsors. Founded in 2008, SportsEngine, Inc. is based in Minneapolis, MN. For more information, please visit http://www.sportsengine.com/solutions; like the company on Facebook at Facebook.com/sportsengine; or follow SportsEngine on Twitter at twitter.com/@sportsengine. With a vision of “Volleyball for Life”, the North Country Region offers volleyball for all ages, skill levels and aspects both within and surrounding the game of volleyball. Providing quality, efficient and organized experiences through playing, coaching, officiating, education and administration. North Country Region is a service organization, dedicated to their members and their interests. For more information, visit http://www.ncrusav.org and follow @NcrVolleyball on Facebook and Twitter.